A few weeks ago, a casual date night saw us tucking into a deli platter at the tasty Friends of Ham restaurant in Leeds. I’m a huge lover of European deli meats and cheese, but when you go to a tapas or Italian restaurant there always seems to be far more interesting things on the hot food menu. So it was awesome to eat at a place where the charcuterie and cheese took centre stage. The place was bustling at half 6 on a Friday, but downstairs was a little quieter and we found seats at the end of a shared table. The decor was rustic but classy, with mismatched chairs, bookshelf wallpaper, rough wooden floorboards and bold typography. I could imagine that I was somewhere in Tuscany rather than right next to Leeds train station. Friends of Ham are also keen to be firm friends of beer too. Rather than needing to go to the bar, they had a list of the many and varied ales they had on tap, and a pretty handy method of indicating which kegs they had run out of. I was also pleased to see, not just cider on tap, but also fruit cider, so I settled in with a pint of Lime Side-R – very refreshing and not too citrusy, just enough to cut through the sweet apple flavour. TC chose a pilsner called Veltins which he described as “very tasty”. They also had a long list of bottled beers and ciders, wines and whiskies, so whatever your tipple, you’re sure to be able to get drunk here in style. Food-wise, they have a variety of sharing boards and you can also create your own from their selection of meat, cheese, small dishes and sides. We selected their Spanish Board and also ordered some bread and oil on the side. The platter was beautifully presented, with wafer thin slices of jabugo iberico ham and iberico bellota chorizo were spread across the board. 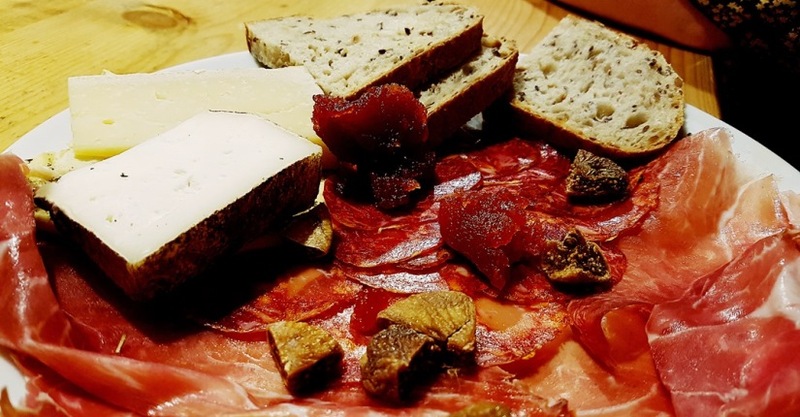 On top were two hefty chunks of cheese – one unpasteurised sheeps cheese called zamorano gran reserva, and a goats cheese called garrotxa which was my favourite thing on the plate. Dollops of some sort of jam (possible quince?) and dates were strewn across, adding a sweet touch to offset the saltiness of the meats. There was bread and crispy flatbread on the board, but we were glad we ordered the extra portion of bread with oil and balsamic vinegar. The dip was very tasty – not just your bog-standard balsamic vinegar, it tasted a little fruitier than normal. The extra bread took the meal from an evening snack to being big enough for dinner.